Each branch of the U.S. armed forces has its own promotion system for its enlisted members. There are nine enlisted pay grades in the military, from E-1 to E-9. The rank or rating varies by branch of service, but the pay grade level is the same. So a private first class in the Army is the Marine Corps equivalent of a lance corporal, both E-3. For the Army, Marines, and Air Force, promotions up to the grade of E-4 are pretty much automatic (assuming one doesn't get into trouble), based upon time-in-service and/or time-in-grade. The same is true for the Navy and Coast Guard up to the grade of E-3. 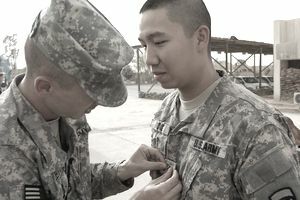 The Army revamped its promotion requirements in 2015, to allow points toward promotion for combat zone deployments, and implements some mandatory education requirements. And soldiers who are not up to the Army's physical fitness standards now may not be considered promotable. The basic requirements for the "automatic" promotions vary slightly across the different branches. In the Army and Air Force, promotion to E-2 status requires six months of active duty and approval by a commander are needed; in the Navy it's, nine months of active duty and commander approval. In the Marine Corps, new enlisted members are promoted to E-2 after six months of active duty, and in the Coast Guard, anyone otherwise eligible who has completed boot camp is E-2 eligible. For promotion to E-3, the Army requires 12 months of active duty service, four months as an E-2 and a commander's recommendation. The Air Force requires 10 months as an E-2 and a commander's approval, the Navy requires nine months as an E-2, demonstrated military and professional qualifications, and commander's approval. To achieve E-3 in the Marine Corps nine months of active duty are required, as well as eight months as an E-2. And the Coast Guard requires six months as an E-2, demonstration of military and professional qualifications, and a commander's approval in order to be promoted to E-3. The next step up is E-4, and this is the last level of pay grade promotion that's considered virtually automatic based on time served. In the Army, 24 months active duty, six months as an E-3, and a commander's recommendation are required; in the Air Force, 36 months active duty, with 20 months as an E-3, or 28 months as an E-3, whichever comes first, are acceptable. The Marine Corps requires 24 months active duty, and 12 months as an E-3 for an E-4 promotion. The Navy and Coast Guard vary from the other branches when it comes to E-4 promotions. Both are based on vacancies within the member's given career field, with an average of about 36 months of active duty. As the Navy and Coast Guard do at pay grade E-4, the other branches become more selective at the E-5 level. Promotions to the grades of E-5 and above are competitive in the Army, Air Force and Marine Corps, since there are always more people eligible for promotion then there are available positions (Congress sets the number of enlisted personnel who can serve in each grade). Promotion rates change each year, based upon several factors (including reenlistment rates) which determine how many slots in each rank will be available. The services each have their own methods to for selecting candidates for promotion, based on points for specific achievements, to promotion boards, to combinations of both. With the exception of the Air Force, which gives the same promotion percentages within each rank to each Air Force job, promotions (in the other branches) can depend greatly upon the current manning-level of your specific job. For example, if you're an E-5 in a Navy rating (job) that is overmanned in E-6, you may be unable to get promoted, no matter how well you do on the tests or other promotion factors. On the other hand, if you're in a rating that is undermanned in your next rank, the opposite may be true. In the Air Force, it's a different story. The Air Force gives the same promotion percentages to all their jobs (exception, some extremely critical jobs get an extra five percent promotion advantage). In other words, if the Air Force decides that their overall promotion rate to E-5 is going to be 25 percent, then 25 percent of the eligible E-4s in each Air Force Specialty will be promoted. This system has a major disadvantage, however—it can easily result in one job being overmanned in personnel of a certain rank, and other jobs (or the same job) being undermanned in certain ranks. The Air Force handles this by identifying those in overmanned ranks/jobs and asking them to re-train. If they don't get enough volunteers, the Air Force will mandatorily re-train enough folks to balance out the rank structure within their jobs.